LAHORE: (Saturday, September 29, 2018): Punjab University Institute of Agricultural Sciences (IAGS) has organized a seminar on kitchen gardening for creating awareness about growing pure vegetables at home. The seminar also aimed at motivating the community for kitchen gardening and practices to meet the food requirement of growing population and boost country’s economy. 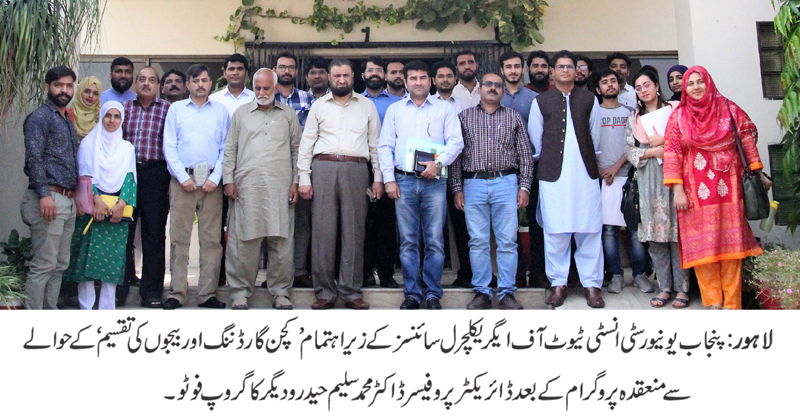 IAGS Director Prof Dr Muhammad Saleem Haider, Chief Organizer Dr Mubeen Sarwar, Garden expert, edible landscape activist Jawad Qadir, Abdul Salam from Directorate of Floriculture, Senior Seed consultant from Engro (Pvt) Abid Dar, faculty members and students were present on the occasion. In his address, Dr Muhammad Saleem said that there was a dire need to educate people about the benefits of kitchen gardening. He assured to provide his services for more seminars and workshops for the benefit of students and community. He thanked all the participants and encouraged students to create awareness about kitchen gardening in their vicinity. Later, shields and seeds of winter crops were distributed among the guests and speakers.